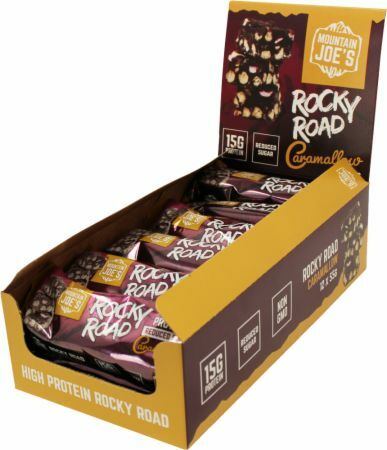 Mountain Joe’s brings to the market the first EVER high protein Rocky Road. The perfect ‘better for you’ option to the well know indulgent treat. Containing sugar free chocolate, protein crispies, cherries, raisins and marshmallows, Mountain Joe’s Rocky Road is the perfect guilt free snack. Each Rocky Road contains 15g protein and is available in amazing flavours. Every bite of these high protein delicious snacks is a different texture, whether it’s the gooey marshmallow or the crispy chocolatey pieces the Rocky Road will no doubt satisfy your taste buds. The rockiest roads lead to the highest peaks! No Rocky Road Bars Reviews Found. Allergens, including cereals containing gluten, are shown in the ingredients list in BOLD CAPITALS. May Contain traces of wheat, barley, oats, egg, peanuts, nuts, Sulphur dioxide as this product was made in premises where these ingredients are used. Contains sweeteners: Excessive consumption may product laxative effect. © 2019 Bodybuilding.com UK. All rights reserved. Bodybuilding.com℠ and BodySpace® are trademarks of Bodybuilding.com UK.